Welcome to the website of The Sultan’s School, a unique educational institute located on one of the world’s largest school campuses, in a truly stunning part of the world. Established in 1977 under the sponsorship of His Majesty Sultan Qaboos bin Said, the school was founded on the principle of offering a world class, holistic, bilingual (Arabic-English) co-educational education to children from early childhood to pre-university, that embraces and strengthens Omani and Islamic culture, whilst encouraging an international perspective. Having worked internationally for over two decades, one of my first impressions upon joining the school, and one that still holds true today, is that The Sultan’s School is a large family with a strong sense of community that extends well beyond the campus. Our graduates attend many of the world’s leading universities, and yet the fact that a large majority of our present students are the children (or the grandchildren) of our alumni shows an extraordinary commitment by our alumni to Oman and the school. We are justifiably proud of the results our students have gained over the last four decades but we believe education is more than just test scores and examination results. Most of our students join the school in Kindergarten and throughout their 14 year ‘journey’, they have the chance to experience so much more than just what happens in the classroom, through our extensive and enviable extra-curricular and sports programme, that is complemented in Years 12 and 13 by an exciting CAS Programme. Having been blessed with such a large campus, we have been able to expand and develop our facilities as the need arises. Today, our students and teachers have access to outstanding facilities that are the envy of many schools. Nevertheless, we are aware that to stay at the forefront of education in the region we need to continue to renew, upgrade and expand our facilities. Most recently, we have invested heavily in renovating and expanding our library, developing a specialist study centre for our IB students, remodelled a number of primary classrooms and have added more accommodation for the teachers and their families. I am confident you will find everything you need to know about the school within this website, but if you really want to know us and see how we ‘open minds for life’, then I would suggest you make a point of coming to visit this amazing school. 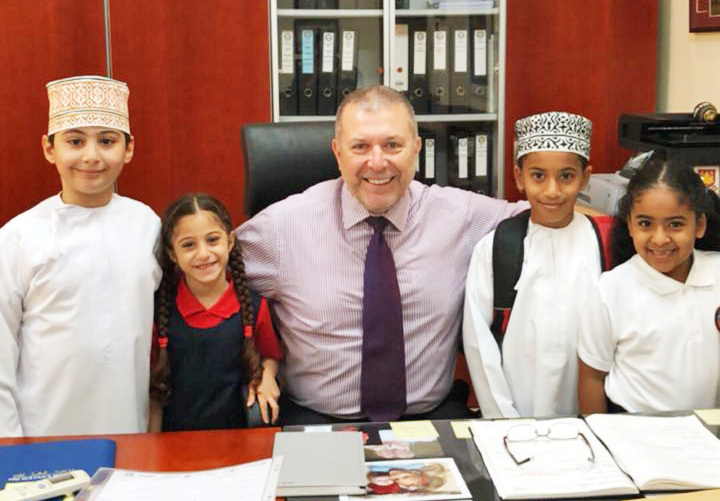 Dr. Glenn Canterford joined The Sultan’s School in 2014 and brought more than two decades of international experience to the role of Principal. Having originally trained as a PE teacher and after teaching for a brief period in the UK, he decided that the British winters were not something he wanted to endure for the next thirty years and so with a round-the-world ticket and a backpack, he set out for a new adventure and thirty years later, he says that adventure continues. In addition to the Middle East, Dr. Canterford has worked in East Africa, the Far East, South America, South East Asia and the Caribbean and has held numerous teaching and administration roles that include, Head of Physical Education, IBDP Coordinator, Head of Secondary and Principal. Dr. Canterford was awarded a Bachelors of Education (B.Ed) from Bedford College of Higher Education, a Master of Science (M.Sc) from the University of Leicester and a Doctorate of Education (Ed.D) from the University of Bath.